Click above to view larger. Metro last year scored a win when Congress adopted part of the America Fast Forward initiative, expanding a federal loan program called TIFIA that offers low-interest, government backed loans. 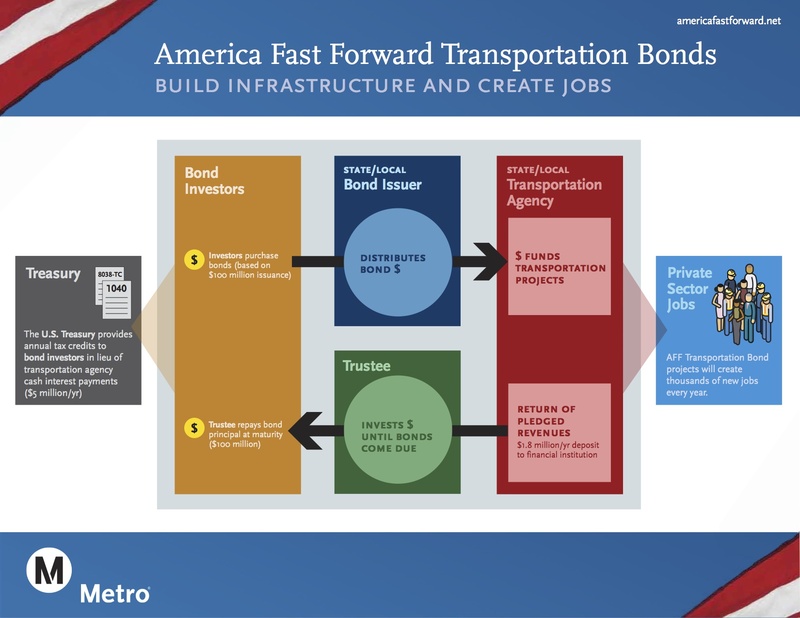 Metro is now pushing Congress to adopt the other half of AFF, a bond program designed to raise money to accelerate transportation projects and create jobs. Which might sound familiar. Everyone in Congress is always talking about job creation, including President Barack Obama in his State of the Union address on Tuesday. Metro believes AFF is a good way of tackling that issue while also dealing with a few others — expanding transit, reducing greenhouse gas emissions and ensuring that our infrastructure remains in good working order. The bond program is a bit complex: it’s taken me a while to get my brain wrapped around it. The above graphic explains it well. In one sentence: those who invest in transportation bonds receive federal tax credits instead of interest, a good way for investors to lower their tax burden and a good way for transportation agencies to save on interest costs. Another way of thinking about it: the program doesn’t ask the federal government to spend directly on transportation projects. It does, however, ask the feds to forgo some tax revenues. Metro is hoping to get the bond and loan program enshrined in the next multi-year federal transportation spending bill. The current bill expires in 2014, meaning a new bill will hopefully be approved by Congress within the next year. New platform decals reinforce the message: let people off the train before boarding the train!